The UC Hopland Research & Extension Center, comprised of 5358 acres, has numerous fenced pasture units. Many of those "pastures" are used for grazing all or part of the Center's sheep flock. 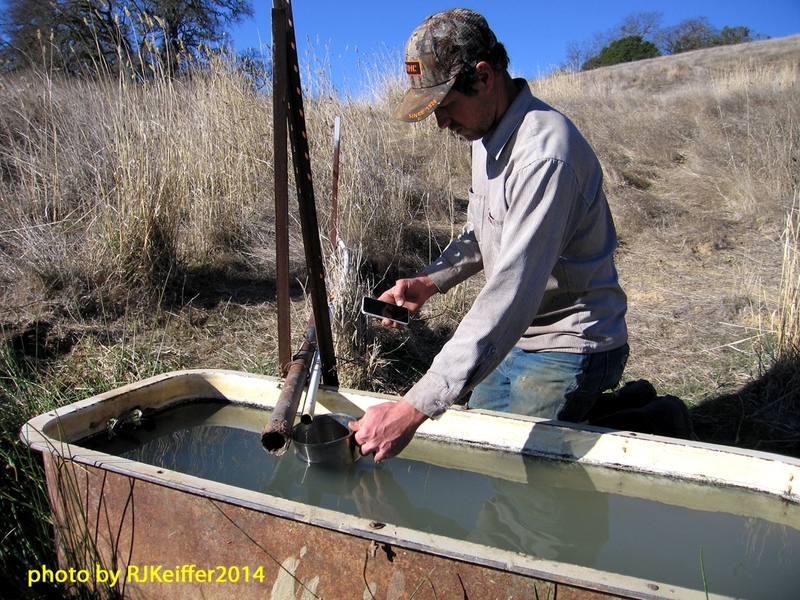 Of course, available drinking water is always a necessity for livestock animals and wildlife, and most of HREC's pasture units contain developed spring water. Every few years HREC measures the outflow of these springs ... and of course there is a high interest in the water production (quantity) of those springs during these current drought conditions. We are in the process of gathering that information ... and there is about a 50% reduction in flow from most of these springs compared to normal, average rainfall years. Here you see Troy McWilliams, Senior Agricultural Technician at HREC, measuring the outflow of Hagan Lake spring. Notice the dry grass in the background ...rather unheard of in any January!